if you troll back through the archive you’ll see that my first post on this blog was made on the 24th April two years ago. Wow. doesn't feel that long. I wanted to do something to mark the occasion, and to say to all the lovely people who follow the blog and comment, thank you, your help, input and encouragement has kept me blogging, and hobbying at times where I might have otherwise not. It’s been important to me that there’s an “audience” of sorts to react to what I’m doing, its been helpful and encouraging and taught me new things. So here's what I’m going to do. I’d like to paint him up for one of my readers. I’ll paint him to fit with your army if you like, or for any chapter you choose, to be part of an army you have, the start of a new one, or if you don't play marines, then I’ll put him on a socket instead of a base and paint him for your cabinet/shelf. or hell you could simple green the guy or ebay him. whatever you choose I'll paint him up and post him to you. Oh and if you’d rather have a sword than a hammer, that’s an easy swap too. 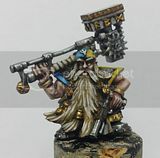 All you need to do for a shot at him is post in this thread saying what chapter you’d like, and whether its to be played with or displayed. Realistically I know I’m no golden demon winner, and that not many people play SM captains any more, but of all the minis I have sat here unpainted, he’s the one that would probably fit in almost everyone’s collections, even if he never gets played, and I wanted to say a small thank you to the people who drop by and read. Some of you are way better painters than me, and likely have no use for one of my minis, some of you have no interest in marines, so I wanted to leave this “opt-in” rather than a blanket draw, and ultimately if no-one comments and wants this guy, I have a plan “b” in mind. Hmm, I don't need him for an army, but if you paint him up like a statue (stone, marble, metal your choice) I'd use him as a bit of terrain! I vote for him to be painted as an Eagle Warrior Captain. I love split paint schemes. Oooh, or Quartered paint schemes like the Nova Marines! FleshTearers are my Marine army of choice. So Fleshtearers and he will see the battlefield. He will lead an Assault squad and kill many of the Emperors enemies. I would say paint him how you see fit, I don't do marines any more but I would love to display him in my cabinet. What I would like to see on him is his armour really weathered like he is a vet from some prolonged war. Congratulations on your anniversary! I hope my work might be as impressive as your offerings by the time I break out my bottle of champagne next year. As for the good Captain, well, while I used to play Dark Angels (and so long ago it was), I think Imperial Fist livery would suit him. Must be the hammer. Grey Space Wolves for my army would be great. Wicked response everyone, thanks, and some great Ideas. I've no problem making him terrain, or any of the chapters listed, though for one or two of them he might need a bit more modification.